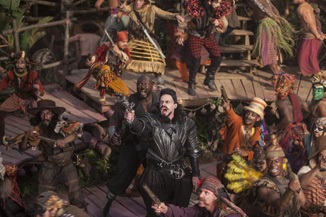 Kim Hollis: Pan, the ill-advised "prequel" to Peter Pan, debuted with $15.3 million. What do you think of this result? Ben Gruchow: This one stings for me. Joe Wright is no hack director, and I can only imagine what was going through his mind as production and postproduction wound down on by far his biggest film. He must have seen what this was turning into. The movie itself is a hyperactive, hallucinatory mess, like what would happen if the inmates at the world's most creative insane asylum made it. I was looking forward to this one when the first trailers premiered, and I hate to see it fall so flat. Matthew Huntley: Unlike Ben, I was NOT looking forward to this one when the trailers first premiered, not only because a Peter Pan prequel simply seemed unnecessary to me, but mostly because it looked the way Ben describes it. To me, the trailer screamed "overproduced mess" and apparently my impressions were accurate according to Mr. Gruchow and the rest of the country (since people tend to avoid "messes" whenever possible). I too hate to see it fall flat because it carries such a heavy price tag (it cost nearly 10x what it earned back on opening weekend, and that's just production expenses), and because Warner Bros. hasn't had a major hit in a while. Plus, someone is bound to lose their job over this, and that's never a good thing. I'll still see the movie at some point to officially form my own opinion of it (its dismal numbers does make me a bit more curious about how bad it really might be), but as far as its box office performance, I'm really not that surprised. Edwin Davies: I'm a big admirer of Joe Wright's work - his version of Anna Karenina was one of my favorite films of 2012 - but this one reeked of disaster for the better part of a year. The trailers were garish and unappealing, the basic concept was devoted to answering a question no one had asked, and the bad news surrounding the film (pushing the release back from summer to accommodate reshoots, the warranted criticism about casting Rooney Mara as Tiger Lily) made it seem like something audiences could easily pass on. It also didn't help that there has been precisely one successful Peter Pan adaptation (the Disney version from 1953), and that one has become such a dominant version of the character that it managed to sustain a string of direct-to-DVD films based around a supporting character. Without the Disney seal of approval, Pan looked like a weird knockoff.